Rabbi Shlomo Yitzhaki, (Hebrew: רבי שלמה יצחקי), better known by the acronym Rashi (February 22, 1040 – July 13, 1105), was a rabbi from France, famed as the author of the first comprehensive commentaries on the Talmud, Torah, and Tanakh (Hebrew Bible). Born in Troyes, Rashi traveled while in his teens to study at the great yeshivot of Mainz and Worms. He returned to Troyes and founded his own yeshiva in 1067, where his reputation quickly spread both as a scholar and judge of Jewish law. Acclaimed for his ability to present the basic meaning of the texts in a concise yet lucid fashion, Rashi appeals to both learned scholars and beginning students, and his works remain a centerpiece of contemporary Jewish study. Rashi's commentary has been included in every edition of the Talmud since its first printing in the 1520s. Rashi also wrote an extensive commentary on the Hebrew Bible, completed in the last years of his life. It was quickly accepted as authoritative by virtually all European Jewish communities, Ashkenazi and Sephardi alike. It would later come to have an impact on the Christian version of the Old Testament through the work of the Franciscan scholar Nicholas de Lyra, who often cited Rashi. Rashi's commentaries, which appear in all printed editions of the Talmud and many editions of the Torah, are an indispensable aid to both casual and serious students of Judaism's primary texts. 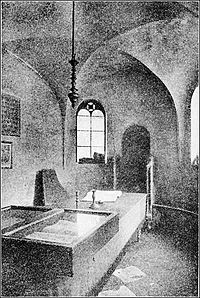 Rashi Synagogue, Worms, Germany. The building was destroyed by vandals in the late 1930s. Rashi was the only child born to his parents, at Troyes, Champagne, northern France. On his father Yitzchak's side, he was reportedly the descendant of Rabbi Yochanan Hasandlar, who was a fourth generation of Gamaliel (the Elder), himself reputedly descended from the royal house of King David. Rashi himself made no such claims regarding his lineage, however. His mother's brother was Rabbi Simon the Elder, community leader of Mainz. Several legends surrounding Rashi's birth have passed into Jewish folklore. Two of the most famous stories concern his conception and birth. One story relates that Rashi's parents were childless for many years. One day, his father, a poor vintner, found a valuable gem or pearl. A bishop wished to acquire this jewel for decorating his church (or vestments). However, rather than have this jewel be used for such a purpose, Yitzchak threw it into the Seine. When he arrived home, a man was waiting for him. "You threw the gemstone into the water so it wouldn't be used for idolatry," the man told him. "Now your wife will have a son who will illuminate the world with his Torah." This harbinger was none other than the prophet Elijah. The following year, Yitzchak and his wife were blessed with a son. Another legend relates that Yitzchak decided to move temporarily to the city of Worms, Germany. He and his wife lived in the Jewish quarter and attended the small synagogue there, awaiting the birth of their child. One day, as Yitzchak's wife was walking down the narrow alley, two large carriages came charging through the alley. There was no room to escape, so she turned to the wall and pressed herself against it. The wall miraculously softened and accommodated her pregnant form. The carriages rushed by and she was unscathed. An indentation in the size, height, and shape of a woman's pregnant belly in the wall of the Rashi Shul was shown to visitors to the city until the building's destruction during the Hitler era. The building has since been reconstructed, using much of its original material. According to tradition, Rashi was first brought to learn Torah by his father at the age of five. His father was his main Torah teacher until his death, when Rashi was still a youth. At the age of 17, Rashi married. Like other young Torah scholars of the time, he then went to learn in the yeshiva of Rabbi Yaakov ben Yakar in Worms, returning to his wife at the end of each semester. When Rabbi Yaakov died in 1064, Rashi continued studying in Worms for another year in the yeshiva of Rabbi Isaac ben Eliezer Halevi, who was a relative and the the chief rabbi of Worms. He then moved to Mainz, where he studied under another of his relatives, Rabbi Isaac ben Judah, the chief rabbi of Mainz and one of the leading sages of the Lorraine region, straddling France and Germany. Rashi's teachers themselves were students of Rabbeinu Gershom and Rabbi Eliezer Hagadol, leading Talmudists of the previous generation. From his teachers, Rashi imbibed all the oral traditions pertaining to the Talmud, as they had been passed down for centuries, as well as an understanding of the Talmud's unique logic and form of argument. Rashi's fellow yeshiva students contributed to the learning with their knowledge of international business, commodities production, farming, craftsmanship, sailing, and soldiering. Rashi took concise, copious notes of everything he learned in yeshiva, incorporating much of this material in his later commentaries. He soon gained a reputation as the greatest young Talmudic scholar of his day. Rashi returned to Troyes at the age of 25, after which time his mother died, and he was asked to join the Troyes beth din (rabbinical court). He also began answering halakhic (Jewish legal) questions. Upon the death of the head of the beth din, Rabbi Zerach ben Abraham, Rashi assumed the court's leadership and answered hundreds of halakhic queries. 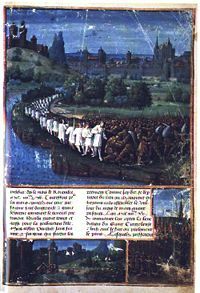 Scene from the People's Crusade, in which many Jews were killed. About 1070, he founded his own yeshiva in Troyes, which attracted many disciples. It is thought by some that Rashi supplemented his living as a vintner since he showed an extensive knowledge of its utensils and process. Although there are many legends about his travels, Rashi likely never went further than from the Seine to the Rhine; the utmost limit of his travels being the yeshivot of Lorraine. Make them a mockery, a curse, a disgrace. Cast fear and panic upon them; send angels of destruction against them. and cut them down to the last man. Rashi became a spiritual pillar of the Jewish communities which had been ravaged by the crusade. He returned to help rebuild the destroyed Jewish Community of Worms and rededicated the synagogue there, which for millennia has been known as the "Rashi Shul." He continued working as a teacher as head of the beth din at Troyes, but in his old age Rashi's health failed him. No longer able to write, one of his daughters acted as his secretary. Many halakhic questions continued to come to him from the greatest rabbinical scholars of his time, and he dictated to her his answers to them. Rashi died at the age of 65 and was buried in Troyes. Rashi had no sons, but his three daughters, Yocheved, Miriam and Rachel, all married Talmudic scholars and produced famous grandsons and granddaughters for him. Yocheved married Meir ben Shmuel—their four sons were Shmuel (the Rashbam) (1085-1174), Yaakov (Rabbeinu Tam) (c. 1100- c. 1171), Yitzchak (the Rivam), and the grammarian Shlomo, who died young. Yocheved's daughter, Chanah, was a teacher of laws and customs relevant to women. Rashi's daughter Miriam married Judah ben Nathan. Their daughter, named Alvina, was a learned woman whose customs served as the basis for later halakhic decisions. Their son, Yom Tov, later moved to Paris and headed a yeshiva there. Rachel married (and later divorced) Eliezer ben Shemiah. Especially after the ravages of the People's Crusade, the number of Ashkenazi Jews in this period was relatively small; and Jewish historian Rabbi Berel Wein has estimated that an amazing eighty percent of today's Ashkenazi Jews descend from Rashi. 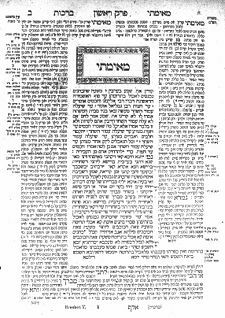 A page of the Vilnius edition of the Talmud. Rashi's commentary may be seen at at the upper right. Although many other important commentators had come before him, Rashi wrote the first truly comprehensive commentary on the Talmud. Drawing on his knowledge of the entire contents of the Talmud, Rashi attempted to provide a full explanation of the words and of the logical structure of each passage. Unlike other commentators, Rashi did not paraphrase or exclude any part of the text, but elucidated it phrase by phrase. He frequently illustrated the meaning of the text by using analogies to the professions, crafts, and sports of his day. He also translated difficult Hebrew or Aramaic words into the spoken French language of his day, giving latter-day scholars a window into the vocabulary and pronunciation of Old French. Rashi also provided punctuation where the original Hebrew did not, clarifying whether certain sentences were questions, exclamations, or even sometimes sarcastic expressions. Rashi also exerted a decisive influence on establishing the correct text of the Talmud. Up to and including his age, texts of each Talmudic tractate were copied by hand and circulated in yeshivas. Errors often crept in. Sometimes a copyist would switch words around or incorporate a student's marginal notes into the main text. Rashi compared different manuscripts and readings of various authorities and determined which readings should be preferred. However, he often included the opinion of scholars who disagreed with him. For example, in Chulin 4a, he comments about a phrase: "We do not read this. But as for those who do, this is the explanation…"
However, some commentaries which are attributed to Rashi were actually composed by others, primarily his students. In some commentaries, the text indicates that Rashi died before completing the tractate, and that it was completed by a student. For example, tractate Makkot was completed by Rashi's son-in-law, Rabbi Judah ben Nathan, and the tractate Bava Batra was finished by his grandson, the Rashbam. There is a legend that his supposed commentary on Nedarim, which is clearly not his, was actually composed by his daughters. 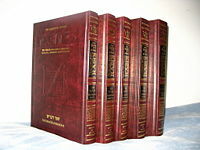 Rashi's massive commentary covers nearly all of the Babylonian Talmud. It has been included in every published version of the Talmud since its first printing in the fifteenth century. In recent times, the Schottenstein Edition interlinear translation of the Talmud based its English-language commentary primarily on Rashi. Similarly, the Gutnick Edition of the Chumash includes Rashi’s commentary in parentheses. Rashi's commentary on the Tanakh and especially the Chumash, or Pentateuch, is the essential companion for Jewish Bible study at any level: beginning, intermediate and advanced. Drawing on the breadth of midrashic, talmudic, and Aggadic literature, as well as his knowledge of grammar, halakhah, and practical wisdom, Rashi clarifies the "simple" meaning of the text. At the same time, his commentary forms the foundation for some of the most profound legal analysis and mystical discourses that came after it. Torah scholars often debate why Rashi chose a particular midrash to illustrate a point, or why he used certain words and phrases and not others. The great hasidic rabbi Shneur Zalman of Liadi wrote that “Rashi’s commentary on Torah is the wine of Torah. It opens the heart and uncovers one’s essential love and fear of G-d."
Legend also surrounds the writing of this commentary, which is seen by many to have been written with ruach hakodesh—divine inspiration—to explain its mass appeal. Rabbi Chaim Joseph David Azulai wrote in his Shem HaGedolim: "Apparently, Rashi wrote his commentary by using a secret [technique to gain Godly inspiration], and therefore he fasted 613 times [before undertaking this project]." According to others, Rashi wrote three versions of his commentary—one long, one short, and one mid-length; the latter version is the one we have today. Rashi's commentary includes all the books of Hebrew Bible except Chronicles (I & II). (A commentary does appear under Rashi's name for those books, but most scholars believe it was compiled by the students of Rabbi Saadiah of the Rhine, who incorporated material from Rashi's yeshiva. Rashi's students, Rabbi Shemaya and Rabbi Yosef, edited the final commentary on the Torah. Some of their own notes and additions also made their way into today's version.) Scholars believe that the commentary grew out of the lectures he gave to his students in his yeshiva and evolved with the questions and answers they raised on it. Rashi only completed this commentary in the last years of his life. It was almost immediately accepted as authoritative by all Jewish communities, Ashkenazi and Sephardi alike. A page from the Christian writer Nicholas de Lyra's Postillae Perpetuae, which cited Rashi extensively. 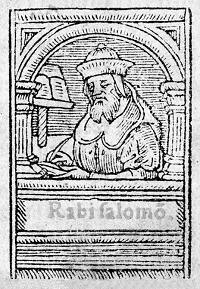 Rashi's explanations of the Torah were also cited extensively in Postillae Perpetuae by the Franciscan scholar Nicholas de Lyra (1292-1340), earning him the name Simius Solomonis ("the ape of Solomon (Rashi)"). De Lyra's book was later consulted in preparing the important early (1611) English translation of the Bible (the King James version). 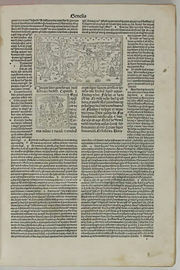 The first known printed book in Hebrew was Rashi's commentary on the Chumash, printed by Abraham ben Garton in Reggio di Calabria, Italy, February 18, 1475. Voluminous supercommentaries have been published on Rashi's work, including Gur Aryeh by Rabbi Judah Loew (the Maharal), Sefer ha-Mizrachi by Rabbi Elijah Mizrachi (the Re'em), and Yeri'ot Shlomo by Rabbi Solomon Luria. Almost all rabbinic literature published since the Middle Ages discusses Rashi, either using his view as supporting evidence or debating against it. Of note in recent times is Rabbi Menachem Mendel Schneerson's "novel interpretation" of Rashi's commentary, which was delivered in a series of public talks that began in 1964, and continued for over 25 years. Following a longstanding rabbinical tradition, Rashi scrupulously included not only his own views, but also those of other rabbis, some of whom disagreed both with him and with each other. What set him apart of other commentators was the care he took to be inclusive and the comprehensive character of writings, covering virtually the entire corpus of both the Talmud and the Hebrew Bible. Rashi was also known as a master of simplicity. It distinction from Maimonides and others, he wrote no philosophical works, nor was he a controversialist. His goal was to represent the core texts Judaism in a clear, accessible manner, an attitude which makes his commentaries as popular today among religious Jews as ever. The following—Rashi's midrash on Genesis 1:27—is a typical example of his hermeneutic. And God created man in His image. In the form that was made for him, for everything [else] was created with a command, whereas he [man] was created with the hands (of God), as it is written (Ps. 139:5): “and You placed Your hand upon me.” Man was made with a die, like a coin, which is made by means of a die, which is called 'coin' in Old French. And so Scripture states (Job 38:14): “The die changes like clay.” …in the image of God He created him. It explains to you that the image that was prepared for him was the image of the likeness of his Creator. …male and female He created them. Yet further (2:21) Scripture states: “And He took one of his ribs, etc.” The Midrash Aggadah explains that He originally created him with two faces, and afterwards, He divided him. The simple meaning of the verse is that here Scripture informs you that they were both created on the sixth [day], but it does not explain to you how they were created, and it explains [that] to you elsewhere. About three hundred of Rashi's responsa and halakhic decisions are extant, copied and preserved by his students. Machzor Vitry contains Rashi's responsa on prayer, edited by Rabbi Simchah of Vitry, whose son, Rabbi Shmuel, married Rashi's granddaughter Hannah (daughter of Yocheved). Siddur Rashi, compiled by an unknown student, also contains Rashi's responsa on prayer. Other compilations include Sefer Hapardes, edited by Rashi's student Rabbi Shemayah, and Sefer Haoraah, prepared by Rabbi Nathan Hamachiri. The complete Hebrew alphabet in Rashi script (right to left). The semi-cursive typeface in which Rashi's commentaries are printed both in the Talmud and Tanakh is often referred to as "Rashi script." This does not mean that Rashi himself used such a script: The typeface is based on a fifteenth century Sephardic semi-cursive hand. What would be called "Rashi script" was employed by early Hebrew typographers in their editions of Talmudic and biblical texts to distinguish the rabbinic commentary from the text proper, for which a square typeface was used. Rashi died on the July 13, 1105 (Tammuz 28, 4865), at the age of 65. He was buried in Troyes. However, over time, the location of the cemetery in which he was buried was forgotten. More recently, a Sorbonne professor discovered an ancient map depicting the site of the cemetery, which lay under an open square in the city of Troyes. French Jews then erected a large monument in the center of the square—a large, black and white globe featuring a prominent Hebrew letter, Shin (ש). The granite base of the monument is engraved: Rabbi Shlomo Yitzchaki—Commentator and Guide. In the summer of 2005, Rabbi Yisroel Meir Gabbai, who renovates and repairs neglected gravesites of Jewish leaders around the world, erected an additional plaque at this site to alert visitors to the fact that the unmarked square was also a burial ground. In 2006, the Jewish National and University Library at Hebrew University put on an exhibit commemorating the 900th anniversary of Rashi's death (2005), showcasing rare items from the library collection written by Rashi, as well as various works by others concerning Rashi. It has been said that without Rashi's commentary, the Talmud would have remained a closed book. With it, any student who has been introduced to its study by a teacher can continue learning on his own, deciphering its language and meaning with the aid of Rashi. Today, tens of thousands of men, women and children study "Chumash with Rashi" as they review the Torah portion to be read in synagogue on the upcoming Shabbat. Since its publication, Rashi's commentary on the Torah is standard in almost all biblical texts produced within the Orthodox Jewish community. ↑ Berel Wein, Rashi's yahrzeit, soccerdad.baltiblogs.com. Retrieved July 23, 2008. ↑ Chabad, Rashi's Method of Biblical Commentary. Retrieved July 23, 2008. Herczeg, Yisrael Isser Zvi. Patterns in Rashi. Southfield, MI: Targum, 2003. ISBN 9781568712345. Pearl, Chaim. Rashi. Jewish Thinkers. New York: Grove Press, 1988. ISBN 9780802131478. Shereshevsky, Esra. Rashi, the Man and His World. New York: Sepher-Hermon Press, 1982. ISBN 9780872031012. Wein, Berel, Berel Wein, Ashley Lazarus, Jesse Cogan, Aryeh Mahr, and Svetlana Pekarovsky. Rashi Hakadosh: A Light After the Dark Ages. Jerusalem: Mahrwood Press, 2007. ISBN 9781583309520. This page was last modified on 25 June 2015, at 15:22.